First of three new Schwab office buildings opens in RidgeGate this month overlooking retail and residential real estate. 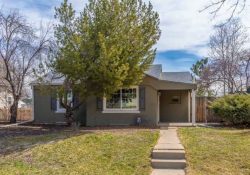 RidgeGate is booming in Lone Tree. 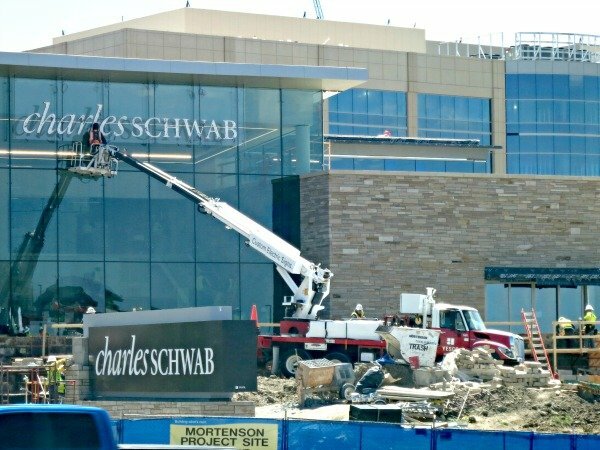 Mechanical cranes are flying high over the new, Town Center complex in suburban Denver as mega-construction continues on several projects including the new Charles Schwab campus. The first of three new Schwab office buildings will open this month! 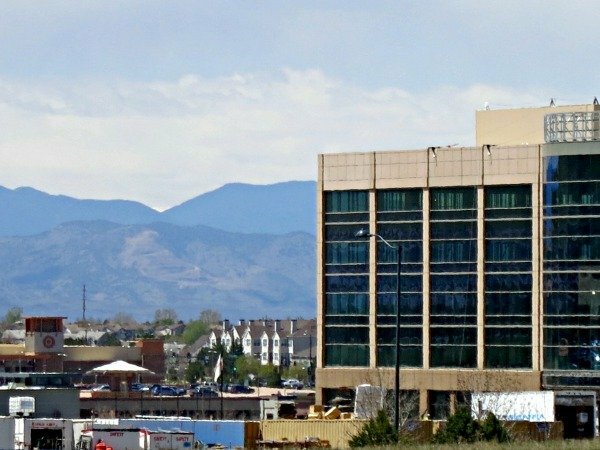 Eventually, the Schwab facility will house 3500-4500 employees at the corner of Park Meadows Drive and Lincoln Avenue near Interstate 25. 1800 of those employees are already scattered throughout the Denver metro area. The rest will relocate here from out of state including the Bay area near San Francisco where Charles Schwab first began his discount stock brokerage. 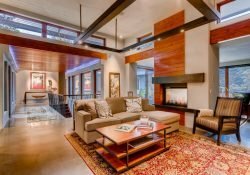 So, expect demand for residential real estate in the area to increase soon as relocation buyers begin moving here over the next several months and years. 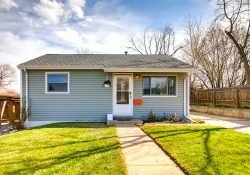 The San Francisco relocation to the Denver area alone will happen over the next 3 years. First Schwab office building will house local Denver employees. Later, Schwab will relocate more from San Francisco. 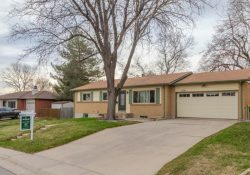 Why is this a good thing for RidgeGate and the Lone Tree area? These new employees will boost demand for retail, amenities and restaurants in the area. While the facility will have its own 3500 square foot cafeteria, some employees will likely utilize nearby eateries too. So, this could be the impetus for fine dining to open in RidgeGate. Only the first of several retail pods has opened there so far. The number of retail shops is small comprising only a couple square blocks. That does not include the Super Target and Safeway grocery stores across the street. This daytime population influx could induce more retailers into the area. 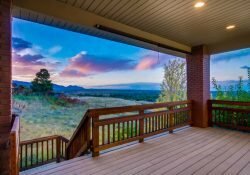 Expanding Skyridge hospital is a welcome amenity for relocating home buyers. RidgeGate already has the Lone Tree Recreation Center and the new Center for the Performing Arts. 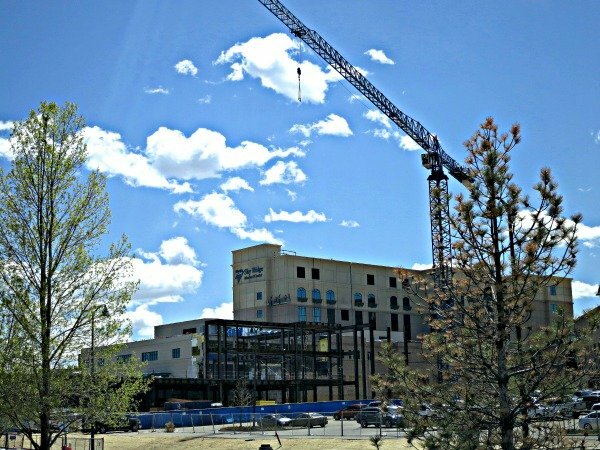 Skyridge hospital owned by HealthoOne is also building a new wing to handle increasing patient loads there. The negative is, of course, increased traffic in in the area especially during rush hours. Monster Schwab Sign Facing Interstate 25 is almost completed. Traffic planners anticipated this problem and have added a new interchange for RidgeGate on Interstate 25. This should alleviate some of the inevitable congestion due to increased traffic at the Lincoln intersection with the I-25. The biggest question effecting traffic is how many of the Schwab employees will use the existing light rail stop at Lincoln. It seems unlikely many will use that public transportation right now. The station is over 2/3 mile from the Schwab campus and it’s not a user-friendly walk. It requires crossing 6 lanes of busy traffic at a Lincoln stoplight. 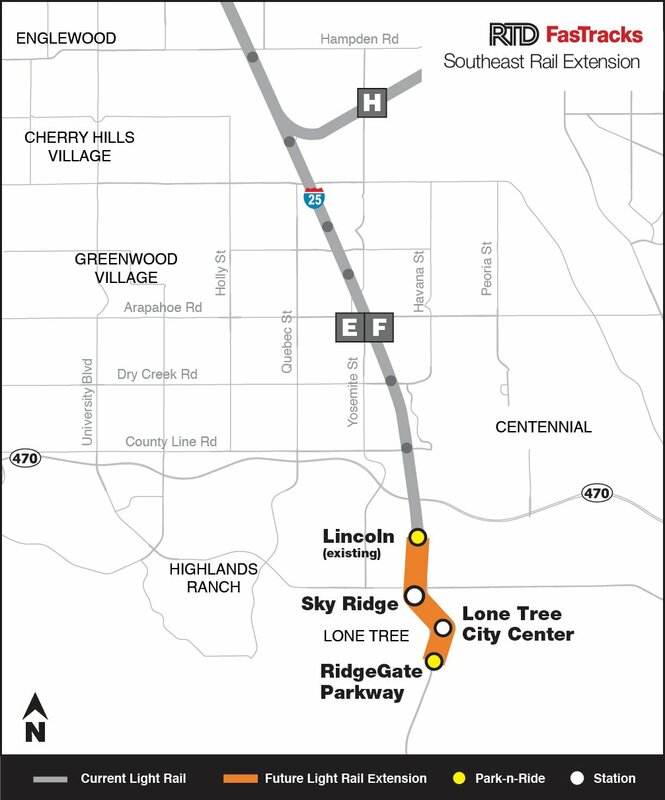 Proposed expansion of Denver Light Rail to Ridgegate in Lone Tree. However, relief may come when the Regional Transportation District opens the planned extension of the light rail south into the Lone Tree City Center. Plans for that have not yet been finalized and approved but the route has been released by RTD. The bottom line is that RidgeGate is happening! 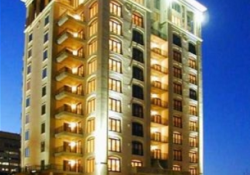 More residential real estate development is coming and demand for existing homes and townhomes is increasing. 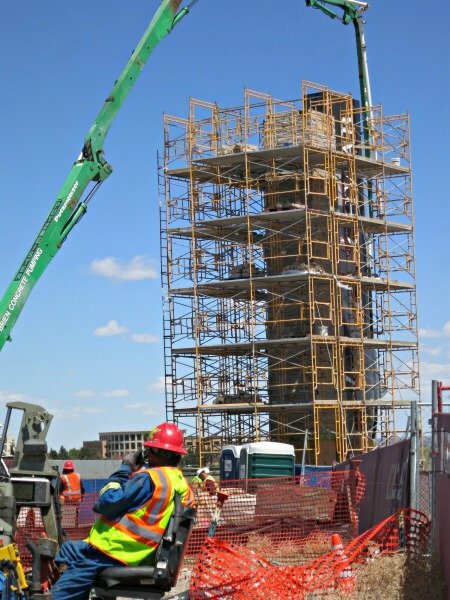 Expect Lone Tree Town Center to be an epicenter of the south Denver suburbs soon. 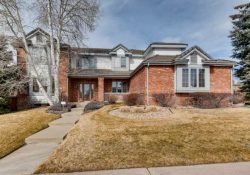 Well kept home in The Pinery is close to this new Ridgegate and Charles Schwab influx of employees filling a few thousand new or relocated jobs.